A vast proportion of UK retail sales are now either made online or influenced by the internet. Every day the percentage of online spend increases significantly. Merlio's Webshop Module provides a painless way for retailers to ensure that they are not left behind and provides a complete Internet shop, which can be tailored to suit the look that you want, and can form part of a larger website to promote your business. 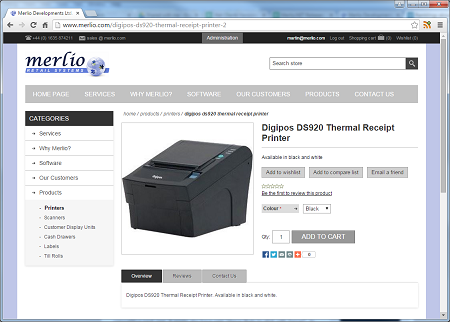 The Merlio Webshop Module links with the Stock Management and Customer Order Modules ensuring a coherent and simple to use system is in place. This works in the same way for customers who come into the shop, call on the phone, or use the Internet.